Effective analysis requires a blend of experience and data, not letting the data blindly drive you. We all want to make the best possible decisions in any given situation, but how people make decisions varies from person to person (and organization to organization). One of the challenges of making the best decisions is knowing how much to rely on the tools at your disposal and how much to rely on your own instincts. Essentially, every problem is solved by an approach situated somewhere on a problem solving spectrum with "relying solely on past experience" on the one end, and "blindly following data" on the other. Relying solely on your past experiences to make decisions is the more attractive of the two extremes. People have a psychological bias to frequently over-value their own skills including their ability to make smart decisions. The reality is that nobody has perfect knowledge and the well of experiences you draw from is heavily biased by your own perspective. In other words, you don't know everything and what you do know is influenced by your point of view. By making decisions solely on experience you are ignoring valuable outside input whose perspective is varied and possibly better informed. For an example of this we can look to baseball, a sport with mountains of data. The Philadelphia Phillies have become notorious for their rejection of analytics to improve the team. ESPN ranked them as absolute last among all teams across the four major sports in America in their willingness to adopt analytics. Rejecting analytics might make sense: if something has worked in the past, shouldn't it work now? We won a World Series, we know how to do this. Unfortunately, with most other teams now using analytics as another tool at their disposal in the race to the World Series, the Phillies are behind before they've even started. They have squandered hundreds of millions of dollars on players that are failing to live up to the hype leaving the team with serious problems. Relying solely on experience is like betting against the house in Vegas: the odds of making the right choices over and over again aren't in your favor. You can get lucky a few times but nobody stays lucky forever. To paraphrase the wolf in Emily Caroll's Through the Woods "you have to be lucky every time to avoid the wolf, the wolf only has to be lucky once." You need outside input to make better decisions. Effective analysis requires a blend of experience & data: don't let the data blindly drive you! Data-driven decision making, as the name implies, is where the data drives what you do. Your brain essentially takes a back seat while you blindly follow what the data tells you, even when it goes against your better judgement. We've heard stories of people following their GPS devices and driving into a body of water or some other hazard. People stop thinking for themselves and defer entirely to machines to think for them. No data set is perfect and while the abilities of computers are constantly improving (such as in driverless car safety using data to make decisions ultimately requires a data-literate person to properly interpret the information. 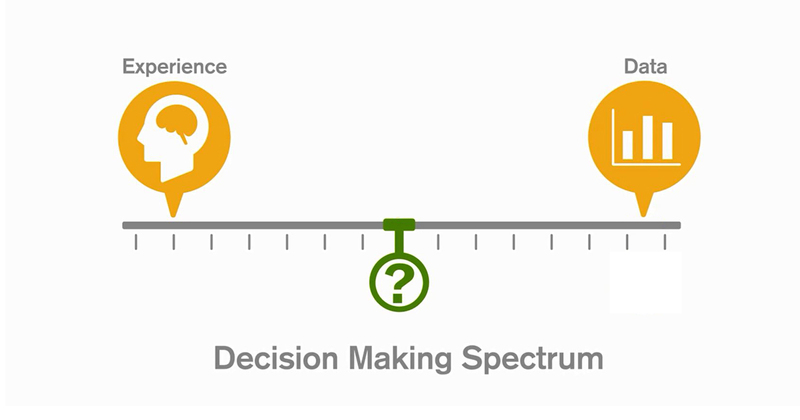 The best way to make decisions is in Data-Informed Decision Making. Data-Informed Decision Making is a blend of experience and data; you are using data to inform your decision making process but not to let it blindly drive you. Ultimately you make the call. It is this blend of human experience and data that has the best chance of success. For example, contrary to popular belief, the autopilot feature on airplanes (more accurately known as the automatic flight control system) doesn't actually fly the plane. Most pilots would tell you that flying a plane is a combination of autopilot (a sophisticated data driven series of controls) and human activity based on experience & training. When the New England Patriots intercepted the goal-line pass by the Seattle Seahawks in the 2014 Super Bowl it was because they knew it was coming. It was a combination of game stats and coaching experience that led the Patriots to prepare a defense for that exact play which helped them to win the game. Data-informed decision making is also good for business. The MIT Center for Digital Business recently ran a study and found that companies taking a data-informed approach to decision making had 4% higher productivity rates as well as 6% higher profits. No person or data set is perfect, but the two combined help overcome the shortcomings of either. Between the internet of things and corporate big data, our personal and professional lives have more data available to us than ever before. Take advantage of this burgeoning opportunity and make the smartest data-informed decisions possible by blending experience with data. Learn more about Data-Informed Decision Making in our live Fika event on Wednesday, June 3rd. Click here to register now!